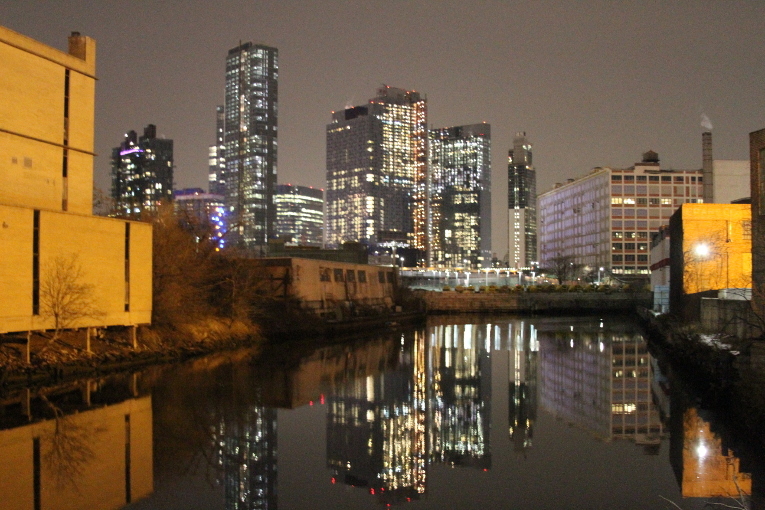 The bright lights of LIC. Calculating the legal regulated rent shouldn’t be difficult, but this is rent stabilization. The reasons to calculate the Legal Regulated Rent are nearly as endless as the multitude of circumstances and idiosyncrasies that are particular to the individual tenant’s apartment. Some tenants will have more data to work with than others. With that in mind, this article will broadly discuss the issues involved with calculating the legal regulated rent. So get a pencil, some paper, and fire up your calculator app. But wait! Before you embark on calculating the Legal Regulated Rent for your apartment, there are two important pieces of information you’ll need: 1) the rent history of your apartment, and 2) the Rent Guidelines Board (RGB) apartment orders. If the building owner has been filing yearly apartment registrations, your apartment’s rent history can be acquired from the DHCR (Division of Housing and Community Renewal) here. If there is no rent history available, your lease, a ledger, a receipt, anything that documents the rent, will do. The RGB is an independent City agency charged with debating and setting the yearly percentage limit on allowable one and two year lease increases. You can download the RGB’s helpful yearly apartment order chart here. Below is an edited example of a rent history, generously uploaded by ProPublica. You can find the original here. Here’s the deal with rent histories – the data generated is based on the yearly apartment registration, which in turn is data generated by the landlord/owner. These documents have next to no legal value. Only a signed lease is legally binding. However, a rent history is helpful in your investigation that will help answer whether the rent you’re paying is at least in the ballpark of legality. For this example, we will calculate the September 1, 2008 rent. You’ll see on the rent history sample that 2008’s history indicates a vacancy lease. A vacancy lease is the first lease a tenant signs with an owner. Here, there are no preceding preferential rents, which is important and we’ll talk about later. This rent history example is one of the few publicly available, so that’s what we’ll work with. The good news is that the same concept applies if you’re calculating the 2019 rent – but the exception is when the preceding tenant had a preferential rent. The question we will answer is whether the $1436.14 rent reported for the time period that includes September 1, 2008, is the proper rent. 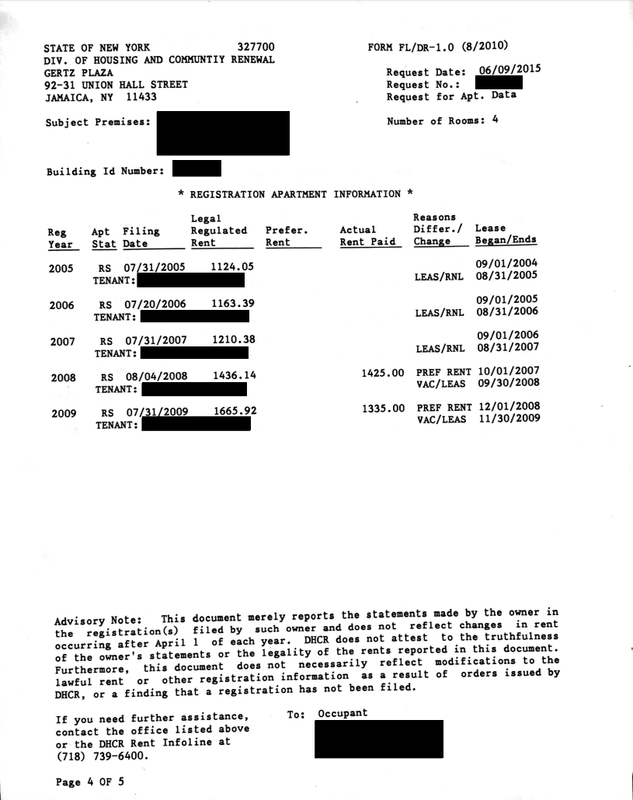 That means the base date is September 1, 2004, and the base date rent is $1,124.05. For the purposes of this calculation, we will assume there is no fraud and that no other 4 year exceptions apply, therefore, we cannot look at any rent data prior to that date. You will also need to know two more important pieces of information – the lease term start date(s) (which is on the rent history, but make sure they match the lease, which is the controlling document), and who is responsible for paying heat in your apartment (this is a legal question onto itself, but until the next article, this question is answered (legally or not) by your lease). This is where your rent history meets the RGB, which is just one of many avenues of legal increases available to a building owner. We are going to assume the owner pays the heat with no charge to the tenant. Since the base date rent is September 1, 2004, and four years after is September 1, 2008, the applicable RGB orders are 36-39. 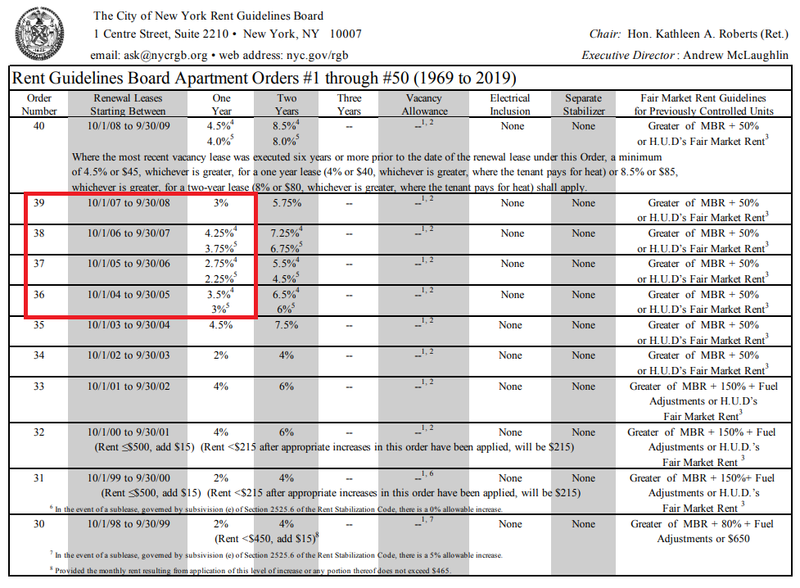 Order 35 is irrelevant with the presumed facts here, since the four year lookback rule prohibits us from looking at whether the basedate rent was calculated properly. Orders 36-39 are applicable here. • Lease term 9/1/2004-8/31/2005 | Rent on September 1, 2004: $1,124.05. • Unfortunately due to the four year lookback rule, you cannot look at the 2003-2004 rent to determine whether the 2004-2005 rent was calculated properly. Unless you have a strong fraud case or another exception applies, you are stuck with this basedate rent. •New one year lease term starts 9/1/2005-8/31/2006 | allowable RGB increase for a lease that begins on 9/1/2005 (heat included): 3.5%. •$1,124.05 * .035 = $39.34 allowable increase. •$1,124.05 + $39.34 = $1,163.39 monthly rent for this term. •Result – the math is correct! •New one year lease term starts 9/1/2006-8/31/2007 | allowable RGB increase for a lease that begins on 9/1/2006 (heat included): 2.75%. •$1,163.39 * .0275 = $31.99 allowable increase. •$1,163.39 + $31.99 = $1,195.38 monthly rent for this term. •Result – possible overcharge! Owner is reporting $1210.38, when LRR should have been $1,195.38. That’s a possible $15.00, per month, overcharge! •New one year vacancy lease term starts 10/1/2007-9/30/2008 | allowable RGB increase for a one year vacancy lease that begins on 9/1/2007 (heat included): 17.25%. •Generally, you can calculate the one year vacancy lease for any year by taking the difference between the one year and two year RGB increases (5.75% (2 year RGB increase) – 3.0% (1 year RGB increase) = 2.75%), and subtracting that percentage from 20%. Here, 20% – 2.75% = 17.25%. Check out the yearly vacancy allowances here. •$1,195.38 * .1725 = $206.20 allowable increase. •$1,195.38 + $206.20 = $1401.58. •Result – possible overcharge! Owner is reporting $1436.14, when LRR should be $1,401.58. That’s a possible $34.56 a month overcharge! Since October 1, 2015, the vacancy allowance will be considerably less if the prior tenant was paying a preferential rent. If your vacancy lease term began after that date, and the prior tenant was paying a preferential rent, then instead of adding the large vacancy allowance (usually around 20%, depending on whether the vacancy lease is signed for 1 or 2 years), there is a very small vacancy allowance, which can be as little at 5%. Read about it here. • $1,401.58 * .05 = $70.08. • $70.08 + $1,401.58 = $1,471.66 vacancy lease rent. Keep in mind there are many other issues a tenant should consider when calculating the legal regulated rent, for example, there could be an outstanding rent freeze order in effect. The only way to learn all issues at play is by acquiring any open (or closed) DHCR cases applicable to your apartment. As a tenant, you have a right to these records.